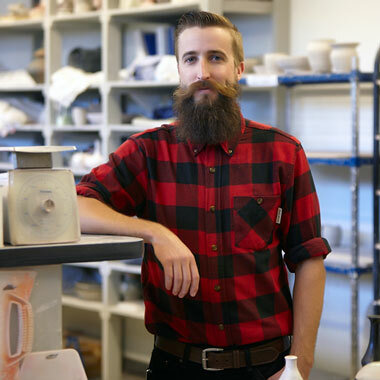 When the ceramics program needed a new soda firing kiln, Visiting Lecturer Chaz Martinsen rallied to rebuild it brick by brick, starting last summer. Over the course of three semesters, a dedicated group of faculty and students tore down the original structure and transformed bricks and mortar into a new kiln for the ceramics courtyard located in Eskenazi Fine Arts Center. Here, Martinsen offers insights into what it took to rebuild and rekindle the kiln. This project has been a massive undertaking with huge amounts of work by multiple people, over many months of time. The work ranged from the exciting teardown of the old catenary arch kiln to the sorting and stacking of salvaged brick, along with the seemingly endless stacking, restacking, and shuffling of pallets full of brick, old and new. It has been a journey of pinched fingers, bruised toes, and cold hands. Step 1. Here is a shot of the old kiln, a catenary arch salt kiln that was thoroughly well-used. It lasted roughly 10 years and had some amazing amounts of crust and texture built up from all the years of firings. The kiln had become too airy and open. It was very difficult to fire and maintain a good reduction atmosphere while increasing the temperature. It looked like a flamethrower when firing at night, so a teardown and rebuild was in order. Step 2. It all starts with the raw materials: planar building blocks, or as I like to look at them, the grown-up version of LEGOS. Step 3. There were a few weeks of straight brick salvaging. This included cleaning old mortar off of brick, sorting and stacking, stacking and sorting, and more stacking and sorting. It happened to be a comfortable yet sweltering and thick 85 degrees when the demo and cleaning took place, as it was late August or early September. Once the area was cleared, we dropped plumb bobs from the roof to lay out and square up the concrete form. With the form in place and checked, checked again, and checked at least five more times, we began mixing and pouring the concrete for the kiln pad — the foundation for the entire build. Step 4. This is the form all filled with cement. As the cement began to cure, I went back over the surface with a float to smooth the surface further. After a few days of allowing the new slab to cure, we cleaned up the pad and surrounding area, which made space for the new pallets of bricks. The arch brick is one of those entire pallets. Step 5. With the new cement slab cured, we started to layout our planar building blocks. We started with a two layers of cinder block, or Concrete Masonry Units (CMU), to get the kiln floor off the slab. The dimensions of the cinder blocks are the same as the footprint of the entire kiln. This was done to limit tripping or odd overhangs and to make an aesthetically pleasing and crisp kiln. Once all the CMUs were placed, we topped them with concrete board to provide a nice level platform to then begin stacking bricks for the kiln floor. Each CMU weighed roughly 30 pounds and we used quite a few. It was a good workout plotting and executing the building plan. Step 6. The foundation of the kiln was in place, so we began to layout the floor. The kiln floor is two layers thick of hard brick, one layer of recycled three-inch fire brick, and one layer of new two-and-half-inch-thick fire brick. We also decided to spice things up a bit and do a visible herring bone pattern in the top layer. Step 7. Then, we began stacking the walls of the kiln. We used what is known as the English Bond wall, a method of stacking bricks to create a structurally stable wall that is nine inches thick and can be built up to five feet tall without additional supports. Step 8. Up and up we go! Here we are continuing to stack the kiln walls. This kiln uses the ever familiar and low-tech brick-up door, built in place with each layer of the walls. The third image is a view from the burner port looking through the fire box and towards the chimney flue. Between the burner ports and the flue, I like to envision all kinds of wonderful pots and sculpture just waiting to get a heavy juicing of soda ash! Step 9. As the walls of the kiln grew upwards, I was planning out the arch. The arch will make or break any kiln. This is not a time to get lazy. To set the initial pitch of the arch, we placed skew bricks on top of the kiln walls. The skeleton of the arch form was made from two-by-four material and then skinned with five-millimeter plywood. I setup one row of arch brick to make sure it would work before going all in. Step 10. Next, it was time to frame the kiln. We used a combination of two-by-two by eighth-inch angle iron to keep the corners square, and a two-by-eighth inch flat strap to tie the frame together. The angle iron was also used to keep the skew backs in place. Since it was quite chilly, a barrel fire was made to keep the hands warm and morale high. Step 11. Arch day arrived. We started by getting the arch form in place and level. The arch was laid from each side simultaneously to insure proper spacing and a good fit. Once the bricks were arranged in the proper order, we arrived to the peak of the arch form. At this point, we needed to hand cut and fit each brick individually to create the keystones — the heart of the arch. Step 12. At this point, we hit a bit of a dilemma. Between the original order/delivery of the pallet of arch brick and the time it took to lay the bricks on to the form, they had accumulated an unreasonably large amount of dust. I feared the dust would allow the bricks to slip and move more than normal, and cause a collapse. We took down each brick, stacked them, and swept the arch form clean as well as hand-brushed each brick to ensure a dust free surface. Once cleaned and sorted, we laid the arch back into place to begin the shaping of the keystones. Step 13. Dusted and cleaned, we tossed it all back on to the arch form. The keystones were hand cut to fit, which are the backbone of the arch. We started with old soft brick to easily shape a template that was then transferred to the dense fire brick. Each keystone had to be custom cut and it was a slow process. A crowd gathered to witness the springing of the arch and the removal of the arch form. The arch form was supported by a series of four wooden wedges. I drilled a hole and tied some line in each wedge so they could be yanked out at the same time. With a person at each wedge, all the wedges were yanked out on the count of three. There was little to no movement as the arch form dropped free of the brick. Fortunately, it was a very uneventful springing of the arch. Nothing went wrong and the arch did not collapse. One huge hurdle passed! Step 14. As students fit the keystones, I started planning out the area that functions as the damper. The damper acts as one of many methods to alter the atmosphere within the kiln. Putting the kiln into more or less a reduction or starving of oxygen, it controls the way heat works within the kiln. Simply put, the more closed or pushed in the damper is, the longer the heat will circulate within the kiln. The more open the damper, the quicker the heat will leave the kiln. This is true for a downdraft kiln, in theory. The interesting part of firing gas kilns are the personalities of each kiln load. Step 15. The back of the kiln wall is all fire brick while the door is a fire brick hot face with a soft brick exterior for better insulation. The fire brick works well in resisting the corrosive effects of the soda ash that is sprayed into the kiln, yet the kiln arch requires more insulation for better heat retention. To improve the insulation of the arch, we mixed and poured a castable refractory. We were aiming for a thickness of four inches to provide proper insulation and limit cracking. When the desired thickness was achieved, the castable was covered and allowed to dry for three days before removing the wooden form. Step 16. Here we have the second half of the chimney: two pieces of sheet steel bent into a ten-by-ten by eight-foot "L" shape by Warner Steel Sales. Jake at Warner Steel Sales suggested to have the sheet bent into two "L" shapes to cut down on the amount of welding we would need to do, which was a stellar idea. It's always a pleasure working with them. While I worked on the metal portion of the chimney, Casey Tesmer took down the brick portion since it was a bit skewed. This was the final push for completing the build, so everything needed to be nice and square. With the help of Andrew Davis, Corey and I got the metal component onto the roof and hoisted and lowered it through the roof to rest on the brick chimney. John Buschbacher then welded the metal portion to the angle-iron frame and apron of the brick chimney. What we have now – after months of planning and hard work, delays and re-dos – is a fresh, clean, and ready-to-be-fired cross-draft soda kiln. From simple brick-moving in hot, humid weather to frigid, snowy days to the early and long hours, coupled with endless pinched fingers and sore backs. A big thanks to all those who involved: colleagues Lesley Baker, Andrew Davis, Jared Smith, and Corey Jefferson for the confidence and endless conversations about all facets of the kiln; and to the many students for their various roles, including John Buschbacher, Kylee Williams, Emily Casella, Casey Tesmer, Scott Russo, Cheyenne West, and others. Let's make some forms and fire this beauty!